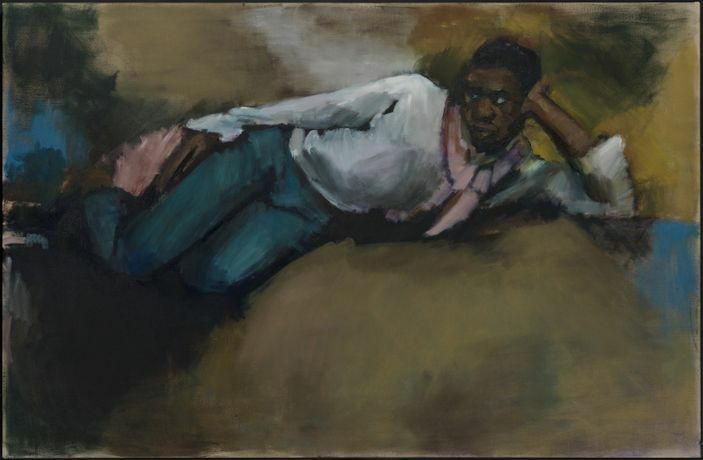 Tommaso Corvi-Mora is pleased to present new work by Lynette Yiadom-Boakye. The exhibition features a new group of paintings, including portraits and figures in landscapes. Tommaso Corvi-Mora is pleased to present new work by Lynette Yiadom-Boakye. The exhibition features a new group of paintings, including portraits and figures in landscapes. Her subjects, mostly black, are bold, often confronting the viewer; the works evoke a narrative that is up to the viewer to reconstruct. Speaking of her subjects the artist says: “Although they are not real I think of them as people known to me. They are imbued with a power of their own; they have a resonance – something emphatic and otherworldly. I admire them for their strength, their moral fiber. If they are pathetic, they don’t survive; if I feel sorry for someone, I get rid of them. I don’t like to paint victims”. Lynette Yiadom-Boakye was born in 1977 in London, where she still lives. She will be the subject of a solo exhibition at Kunsthalle Basel in November 2017. The gallery is open Tuesday to Saturday 11am to 6pm.